A Level of Comfort and Service that Considers all your Senses. Poerava Business Class provides a level of comfort and service that considers all your senses, immersing you in Tahitian hospitality from your first step on board. Your journey begins with a fragrant Tiare flower, the national flower of Tahiti, and the same one painted with pride on the tail of our airplanes. Breathe in deep this hint of exotic flora and settle into one of 32 roomy and well-appointed seats in couple-friendly pairs. 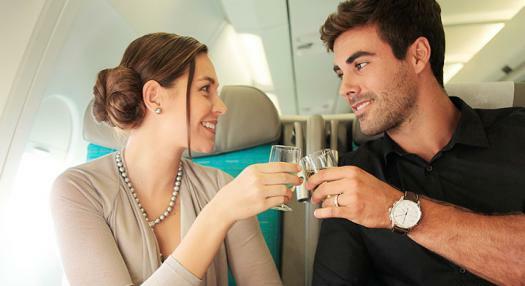 When you fly with us, it's our priority to make you comfortable and to share Tahiti and her islands with you. We're certain it won't take you long to see why. A convenient hook for handbags and clever storage compartments let you put things within reach but out of your way. Straight ahead is your personal, crystal clear 12-inch high definition touch screen. Glide through menus for movies, TV shows, features on your destination, music, video games and much more. If you’ve brought your own entertainment on board, keep those devices fully charged in the outlet or USB port in the center console. Multi-point seat adjustments are at your fingertips. Recline a little and begin to relax, or keep reclining to a full 160 degrees to a pitch of 60 inches and enjoy how the seat’s design optimizes privacy. With alternating white and grays, the flight's cabin represents the natural mineral tone of the white sandy beaches and the iridescent quality of the black pearl – an integral part of the richness of Polynesia. 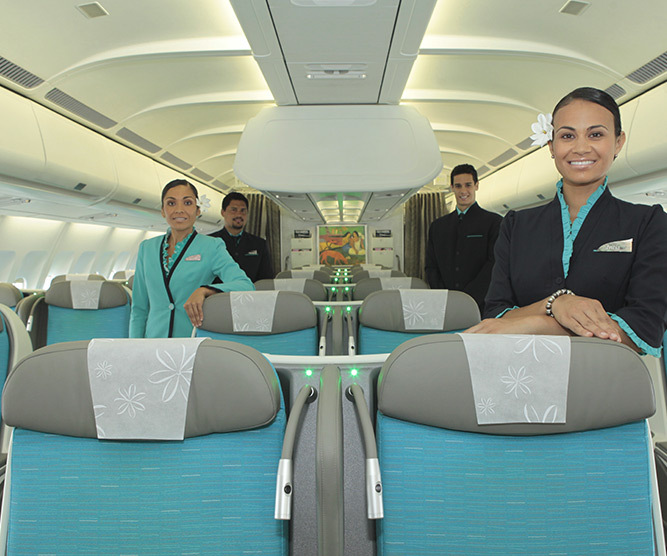 While on board, you'll notice the white Tiare flower throughout the cabin, the symbol of our airline and flower of Tahiti. The cushions, custom-designed for Air Tahiti Nui, are inspired by the Tahitian handcrafted "tifaifai" – meaning to mend or to patch. This technique of decorating fabrics by patchwork is found throughout French Polynesia's interiors. Colorful cushions in economy look like scattered exotic flowers, while the business class motif is that of green palms offering a clean, fresh feeling. Materials and designs in amenities are reminiscent of Polynesian arts, crafts and plant textures, such as the tapa (Polynesian bark cloth). A variety of meals are served in-flight, balancing both the Polynesian and French culinary influences with specialties for each of our destinations. For the wine lover with a sophisticated palate, an array of wine selections is available, particularly from the French and New World. Have a food allergy or dietary restriction? Special meals can be prepared upon request when booking or at least 48 hours prior to departure. Simply state your request and choose from one of 11 different meal options to suit your dietary needs. Our business class passengers have access to a priority check-in lane at our counters, access to a VIP lounge (LAX when available) and priority handling of baggage for quick delivery. On the ground or in the air, whatever it is you need, you’ll find your attentive hosts ready to make you comfortable and satisfied. Welcome to Poerava Business Class. Our famous Poerava Business Class has been enhanced with the introduction of a 180-degree full-flat seat designed by Rockwell Collins. The Parallel Diamond, designed to optimize space, includes a wide range of storage areas. 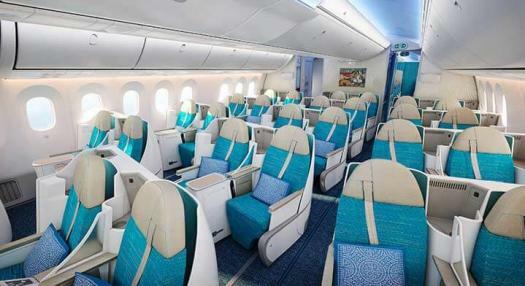 The cabin features a total of 30 seats configured in five rows on a six-abreast (2-2-2) arrangement. Installed at a 60 inches of pitch, the new business class product moves into a fully flat 78 inches bed for sleeping. 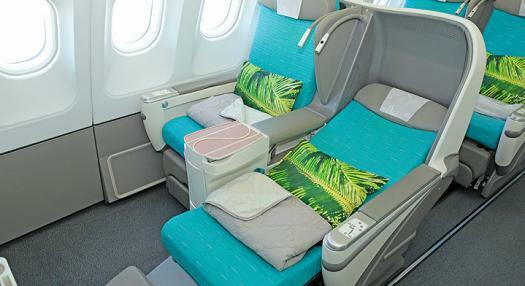 Each seat is equipped with a luxurious cushion and cover comfort system for restful travel. 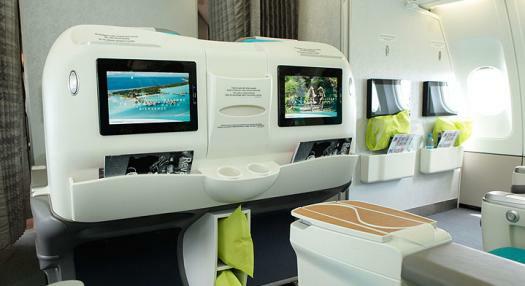 The seats also offer an individual touch screen remote control for the inflight entertainment system, personal lighting and privacy divider. The onboard amenities include: a thick duvet, one large and comfortable pillow and a luxury kit of accessories.